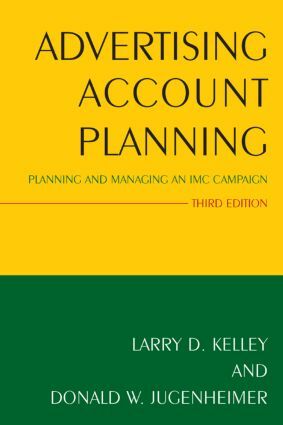 Concise yet comprehensive, this practical guide covers the critical role of the account planner in advertising. The new edition of Advertising Account Planning features several new topics as well as deeper content in existing areas based on feedback from students, instructors and practitioners. Larry Kelley is a Professor of Advertising at the Jack J. Valenti School of Communication at the University of Houston, USA. He teaches advertising media planning, advertising account planning, and prinicples of advertising, among other classes. He has authored or co-authored 7 books. Donald W. Jugenheimer is an author, researcher, consultant and educator. His specialties are communication, advertising and media management, media economics and advertising media. He has authord or co-authored 20 books.